This charged comedy explores what a couple’s experience is with their new neighbors, the Joneses. This couple, a middle class pair with two sons, goes from their normal lives to ones involved with a high-stakes mission that includes heavy shooting and speedy car chases. 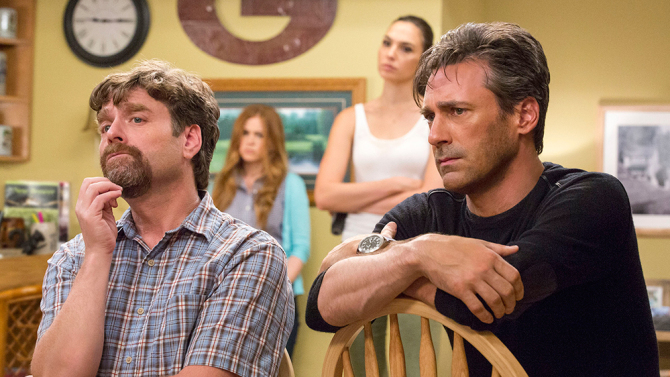 Zach Galifianakis and Isla Fisher bring a wickedly clever slapstick vibe to the screen. They both pull off very well the parents who are comfortable with each other and their jobs. The script was full of well planted opportunities to instill great laughter in the audience. One scene involves Galifianakis’ character, Jeff, opening a beer bottle with his hand right after their new neighbor just pops it open effortlessly. What ensues is Jeff tearing his hand and severely cutting himself and Galifianakis brings his startle and jolt of pain in some brilliant comedic timing. Jeff was probably the most entertaining character within this whole plot. He’s an HR representative who deals with people in his trained way of trying to calm them and is a good communicator. The character is a little dumb and extremely innocent which lets his encounter with the covert operative neighbors be all the more climactic. The film sets its tone in the beginning when Jeff narrates that everything at home is always okay and then within seconds a house blows up. These types of scenes were where the film gained the greatest appeal. A scene where something occurs that is so ludicrous or when a character says something that one wouldn’t usually hear was the milk of this picture. One of Jeff’s pals says Kinko’s was bananas and Jeff responds with that it usually is. This was fantastic humor and the classic Zach Galifianakis. I was pleased with another use of actually funny comedy in combination with the spy genre. The last obvious hit with this blend was Melissa McCarthy in Spy. Another brilliant use of writing was when Jeff asks a man to pick up his dog’s poop off of his lawn and then the man just leaves with these large feces laying there. That is the thing about Jeff is that he is such a harmless, nice, and ultimately goofy guy. Isla Fisher is always a catch for the energetic woman and is no novice to comedies. The action sequences were cleverly choreographed with windows breaking, automatic guns firing, and massive explosions. In one scene, there is a phone that acts as a card imitator to get into buildings which I had not seen before. Overall, this film carries characters that are exceptional for the actors and invested action that is engaging to watch. It is sure to please.